It’s been a while Lions fans! I hope you’ve all been having a great off-season. If you’re like me, it’s already too long. I miss my Friday Night Football, tailgating and all the good times that come from being a CFL fan. That said there have been some interesting things going on around the league so I thought it would be a good time to touch on a couple that will have an affect on the BC Lions. If you follow Emmanuel Arceneaux on Twitter you probably know by know that the Lions receiver is not likely returning to the team in 2011. 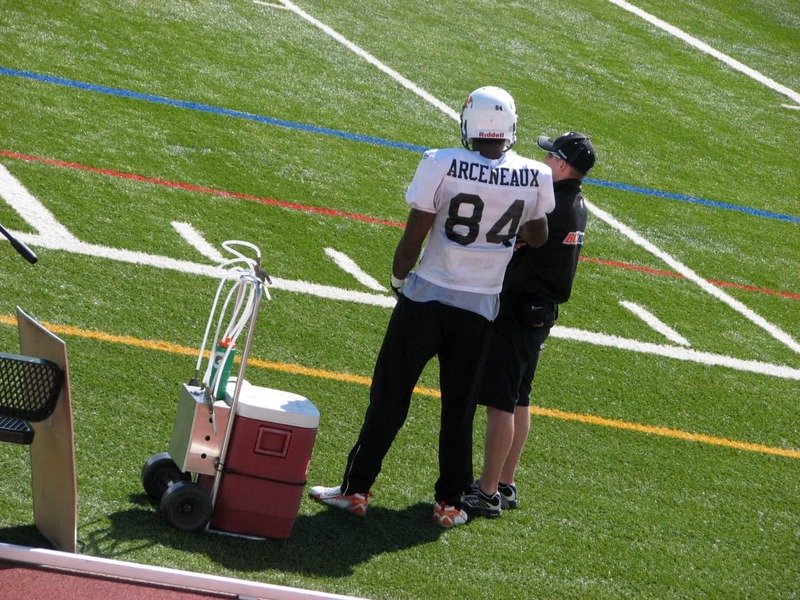 Arceneaux has been actively tweeting about his NFL tryouts, and has stated he’s close to signing with an NFL club. His agent confirmed those statements in a recent articleby Matt Sekeres of the Globe and Mail. Bardia Ghahremani, told the Globe that five NFL teams have shown interest and Arceneaux could make more in signing bonus money than he would on a new deal with the Lions. He also doesn’t think there will be an NFL lockout, which may be wishful thinking on his part. If there is a lockout and Arceneaux is under contract to an NFL team, he won’t be able to return the CFL, and could miss a year of football. A year he could be honing his skills in the CFL in preparation for even a bigger pay day, similar to the one Cam Wake received from Miami (A 1 million dollar signing bonus). The Lions had an offer on the table for Arceneaux, and Wally Buono felt a deal was doable. Buono told Arceneaux to make it wothwhile if he decided to bolt for the NFL. Of course every player deserves to chase his dreams, and we wish Mannie all the best, whatever decision he makes. The departure will leave a hole in the Lions receiving corps but should allow for Steven Black, Andrew Harris and Jamal Lee to assume larger roles. No doubt the club will be looking for more replacements in their upcoming free agent camps as well. If everything proceeds as planned, the Ottawa team could take the field for the 2013 season. In that case, the expansion draft would be conducted on or about Thursday, December 13, 2012. It will consist of three rounds: one for imports, and two for non-imports. Ottawa will be able to select a total of eight imports and 16 non-imports, including two quarterbacks, from existing teams. If the team is ready to start play in 2013, Ottawa will pick first in all six rounds of the 2013 CFL Canadian Draft, after picking as many as four underclassmen from the NCAA in the 2012 CFL Canadian Draft. Ottawa will have the ability to select not more than two quarterbacks and not more than one kicker or punter (for clarity, Ottawa may not select a kicker and a punter). A Member Club cannot have both a quarterback and a kicker or punter selected from its roster. A Member Club cannot have more than one quarterback selected from its roster. Member Clubs may protect one quarterback, and ten additional Import players. Ottawa will select one Import player from each Member Club. Each Member Club may protect a maximum of one quarterback in the Import Draft. All other quarterbacks on a Member Club’s roster at the time of the draft are eligible for selection in this section. Ottawa will only be able to select two quarterbacks in the Expansion Draft. If a quarterback is selected from a Member Club in the Import Draft, such Member Club will be able to protect the names of an additional two Non-Import players in the first round of the Non-Import Draft. If a kicker or punter is selected from a Member Club in the Import Draft, such Member Club will be able to protect one additional Non-Import player in the first round of the Non-Import Draft. Each Member Club will protect six Non-Import players. Ottawa will be prevented from also selecting a kicker or punter from that Member Club. If a Member Club had a kicker or punter selected from its roster in the Import Draft. Ottawa will be prevented from also selecting a quarterback from that Member Club. Any kicker or punter selected in the Non-Import Draft must be selected in the first round. If a Member Club had a kicker or punter selected from its roster in the Non-Import Draft, such Member Club would be eligible to protect eight Non-Import players in the second round of the Non-Import Draft, instead of six. Ottawa will then select one non-import player from each Member Club. Member Clubs will then submit a second list of an additional six Non-Import players for protection. If a Member Club lost a Non-Import kicker or punter in the first round of the Non-Import Draft, such Member Club would submit two additional Non-Import player names for protection. The Commissioner will resolve any dispute related to player eligibility for the Expansion Draft process. Not a bad deal for Ottawa if they should get some good football people in place and draft wisely. It will no doubt hit some of the Member clubs hard depending on the players they lose. The idea will be to have Ottawa competiive right out of the gate to ensure the public support the club. Several member teams, including the Lions benefited greatly through the dispersal draft the last time Ottawa folded.